Bottom tier: cucumber slices, grape tomatoes, and of course, hummus! I've got a lot to talk about today! First, the taramasalata macaroni. This is my version of tarako spaghetti, using what's available to me. A while back, I realized that I really like cod roe spread, known as "red caviar spread" at Turkish Kitchen and taramasalata in Greece. Of course, it was phenomenal at those two places, but while we were in Greece, I saw it in every grocery store we ventured into (maybe 3? You can tell a lot about a country by its supermarkets, and also, they have some snacks that are just crazy and totally unavailable here) in the area where you might find string cheese in a US supermarket. Right by all the prepackaged cheeses and "deli" items. So about a month ago, I decided it must be found somewhere here, I'm in a huge city and we do have our pockets of Greek neighborhoods... I'd found it online but wanted to see it in person before I shelled out for it... and I finally found that very same brand in a very ethnic store in my neighborhood (they sell all sorts of cool foreign items, including these wonderful looking cartons of various nectars that I desperately want to try, especially the cherry nectar, that must be so good splashed in a Grey Goose/cranberry drink...). I mentioned mixing it in pasta a few weeks ago so here it is, and I was right: it's perfect, no additions needed. The green onions were for color and because I like the flavor of green onions. Chicken thighs - boneless/skinless in this case, but I don't mind being frugal and buying them with the bone in/skin on, or even with drumsticks attached. I think it works best with dark meat though. KC Masterpiece BBQ sauce- I'd prefer to use my own, but it's been a while since I've had the time or inclination to make any. Crushed red pepper flakes, to taste. (Bento is my way of controlling my weight, and I read somewhere that if you eat spicy foods, you're less likely to snack later. You can totally omit these if you like though.) Alternatively, you can add a bit of honey. Line a baking dish/pan with foil (easy clean up! this dish is all about easy everything). Rinse off chicken, pat dry, place in dish and sprinkle a teensy bit of salt and freshly ground black pepper over chicken. Bake at 350 degrees for a little bit until chicken is more white than not (this should only take 10-15 minutes in a toaster oven, like I use). In the meantime, mix the BBQ sauce with the red pepper flakes and/or honey in a small bowl. Once the chicken has turned white, you can slather on some BBQ sauce, cook for a bit longer, then flip it, cook for a bit longer, and keep it up with the BBQ sauce. You'll probably want to throw all of the BBQ sauce on there and let it heat through just to be sure any and all germs from raw chicken are killed. Total cooking time for 5 chicken thighs should be at least 30-35 minutes, you can let it go longer if you like or if your chicken doesn't feel done. Once done, allow to cool slightly, move to a container (taking all the sauce with it!) and using two forks, pull the chicken meat apart. Voila! Kickin' chicken! and perfectly sized to put in your bento- no bones, no mess, just use a fork and you're good. Enjoy!!! Last but not least, my cucumbers! These are a bento's best friend. Well, one of them. Known as hothouse, English, seedless or burpless cucumbers, these bad boys come wrapped in plastic and don't need to be washed or peeled. The skin is thinner than regular cucumbers (I believe that's why they're called burpless) so in the morning, if you're looking for something green, all you have to do is whip one of these out of the crisper, slice away and pack! No washing, peeling, really no fuss about them. Great with hummus, too! Happy bento and as always, if you have any questions, feel free to ask!!! woohoo! thanks for sharing. 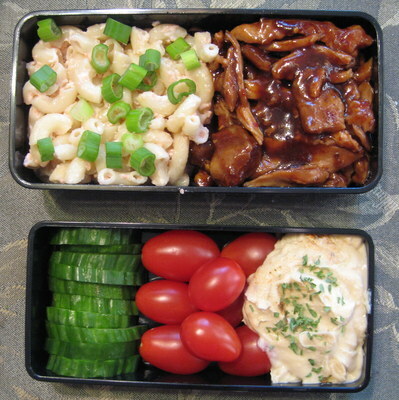 i've done bbq chicken drummettes in the oven, but stopped since they don't fit my bento lifestyle. this is the perfect substitute. Ahhh oops, I should have mentioned, if you do use bone-in chicken (so much cheaper!) just use the fork method and take the meat off the bones. While it's still warm/hot, it should come off super easily =) Hope that helps! Feisty Bento #96: Happy New Year!!! Feisty Bento #95: Christmas presents!!! Feisty Bento #94: Xmas Dinner Leftovers! Feisty Bento #90: Welcome Back Bento! Feisty Bento #89: Short day bento! Feisty Bento #87: Oh my curry! Feisty Bento #85: Supply Alert!